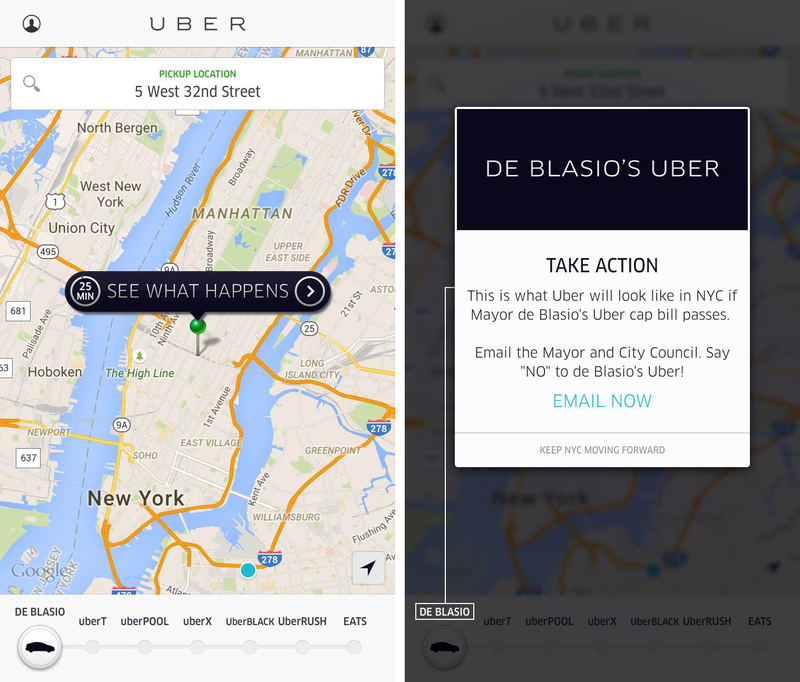 Uber’s campaign against Mayor Bill de Blasio has spread to its ride-hailing app. In Uber’s quest to take over the world, expansion is key — the more drivers it has on the roads picking up passengers, the better its business will do. But in New York City, the company will have to fight to grow its fleet as local authorities consider putting limits on just how many for-hire vehicles will be cruising the streets. City officials could vote as early as next week to limit increases in what’s called new for-hire vehicles (FHV), reports the AFP, as soon as a study on their impact on traffic comes out. Mayor Bill de Blasio’s administration could put limitations of just 1% increase in FHVs per year for companies with more than 500 vehicles, and 5% on those that have between 20 and 499 vehicles. “What is good for Uber may not be good for New York City,” city hall spokesman Wiley Norvell said, noting that there are currently more than 20,000 Uber vehicles in the city, compared to 13,857 yellow cabs. The ride-sharing service also added a “de Blasio tab” to its app to show users how much longer they’d have to wait for a ride if the bill putting limits on FHV expansion wins approval.